First, tape your glass down to the surface you are working on. This will help you center your photo transfer, protect you from the sharp edges and keep the glass in one place while you work on it. Then, cover the face of the picture completely with the transfer medium. *Note, please keep in mind that this image transfer will be the reverse of the original, so don’t choose something that will look strange backward. Next, place the photo face down onto the glass. With the pads of your fingers, pressed down all parts of the photo and try to rub out any air bubbles or globs of gel. Allow to dry completely. When it is dry, begin to remove the paper. The image will remain in the dried transfer gel. Use the wash cloth to soak the paper, and then start rubbing…and rubbing and rubbing until all of the paper is removed. This process takes some time! The paper comes off in layers, so let it dry and then come back to it and keep rubbing off the paper. 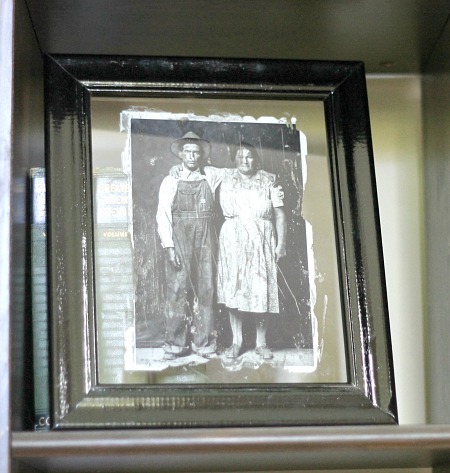 One of the things I love the most about photo transfer is that it has an old-time rustic look, which is why I wanted to do a photo transfer of this photo. 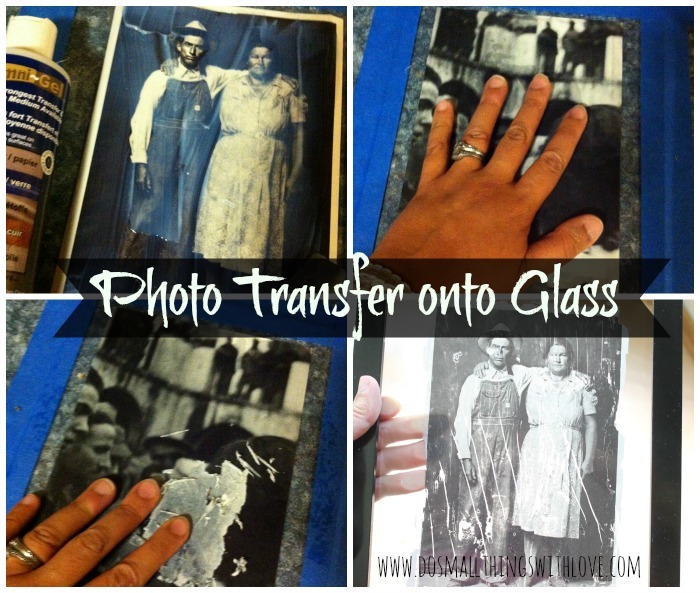 Give photo transfer a try–and I’d love to know how your project turns out! Ahh..what a lovely idea. I would never have thought of this. I’m going to see if I can make something for my grandmother. I was wondering if you could use inkjet water slide paper. I only have an inkjet printer. You can try…but I think the ink will smear. Do you have a video of this process? I would love to view it! I tried this on a mirror and on mine even after i rubbed all the paper off, the white paper that had gel medium on it stayed on their with the image… It looks like the gel dried white and became part of the image. Any suggestions how to just get the image to stay and not the ‘white border’? I can send a picture if this doesnt make sense. Thanks! Quick question. 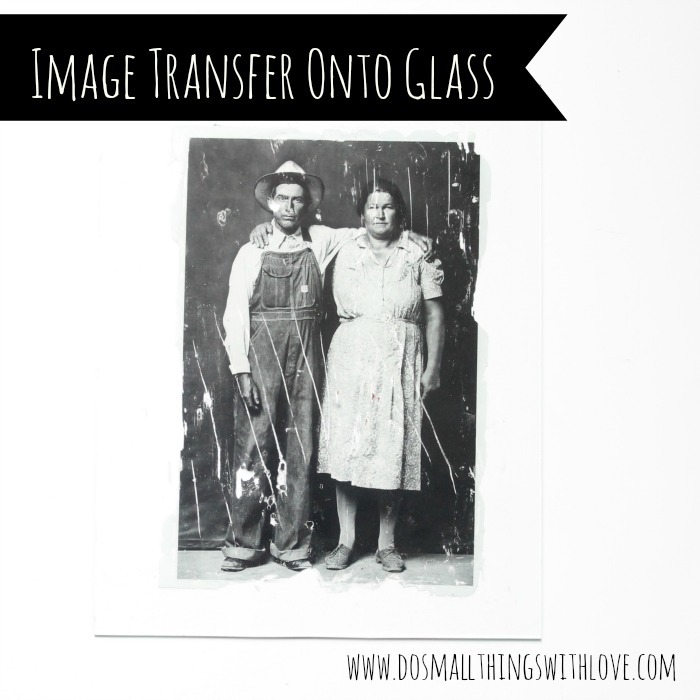 I have read a few blogs/how-tos on photo transfer to glass and all of them say to use a laser jet printer. Can you explain why? I am just curious as to the reasoning. images printed on an ink jet printer will smear once they get wet. Thank you for sharing your photo transfer. I found your information on the Homestead ad on FB. I was wondering if you would like to do some blog sharing/hopping? I am new at the blogging and would love to learn more about how you went about your blogging. Thanks so much and I will not put my website on here unless you ask me to share it. Thank you for sharing your photo transfer. I found your information on the Homestead ad on FB. I was wondering if you would like to do some blog sharing/hoppinig? I am new at the blogging and would love to learn more about how you went about your blogging. Could u please make a video? I don’t want to mess it up .. I just finished a photo for my sons wedding (loved doing it) but did you put any thing on the back of your picture when finished to seal it? I usually just put a coat of matte mod podge. Sounds like a cool project! Have you ever tried to transfer to eye glasses lens? I am trying but cannot figure out how to work with the curve. What a cool idea! I haven’t tried this myself, so I have no tips. Maybe get the paper wet first? I found this site while researching ways to transfer pictures to mirrors. I etch glass and have been asked if I can do mirrors,but I needed a way to get the pic onto the mirror to etch. I was wondering if you thought this might work for that, because the picture wouldn’t be left on it after I’m done at least not the printed one anyway. I would greatly appreciate your imput on this. If you have any other suggestions I’m all ears. Thanks for your help and imput in advance. Sounds like a really cool project, but I am totally clueless when it comes to etching. So sorry! Is the process the same for photo transfer onto a *mirror*??? If so, I want to do it as a decor for our wedding. Thanks in adv.!! Yes, it would be absolutely the same! What a cool idea! Do you have a blog on utube showing how to transfer photos onto glass? I see this one but I would like to see a demonstration. I have a old door with a window I’m going to make into a wall hanging/ coat rack and add a few other things to it. It would be wonderful if you could show me how to do this. Thank you. Sounds like a really cool projects. I don’t have a video at the moment, but I’ll work on one and let you know when it is ready. hi!! I was just wondering where do I go to find that certain gel medium? Or will any gel medium work? Thank you? No problem! There is a link to the stuff I used in the supply list above. You can also find it with the glue at any craft store. Best of luck! Hi, Nancy! I was wondering if you knew the couple in the photo? Because I was suprised when I saw it on my Facebook it is a photo of my husbands grandparents. That is so wild! I actually fond this pictures in a National Geographic book entitled “Love”, so something like that. I was looking for something like this to try for a vintage decoration for the lanterns we are using for her wedding. I wanted to incorporate some old pic of family that has passed away. We wanted to have the feeling that they are still with us and what better than to have older pics of grandparents and famliy that has passed in formal attire placed on tables . Im hoping it works out. What a wonderful (and really cool) idea. I hope it works out! I’m great at over-complicating things too! Best of luck with this project–and don’t get discouraged at the rubbing-paper-off stage. It can take awhile! I am guessing that you cant just use a normal photo. It can be any photo, as long as it’s printed with a LASER printer. I am guessing that you just cant use a normal photo. Can you use a photo printed on photo paper? No. It has to be on regular paper. Part of the process is rubbing off the paper and leaving the ink behind, so photo paper would not work. My daughter did this on an 8×8 artists canvas as a Christmas gift for us this year. She actually used tissue paper (gift wrapping tissue) that she taped to a regular sheet of paper so it would make it through the printer. Then removed it and just proceeded with the tissue paper image. And she used our inkjet printer. It came out great! Thanks for taking a minute to share this tip! I have yet to try a photo transfer with tissue paper, but I can see how it would be a great thing to do. Definitely on the to-do list! This sounded like a great idea, but after reading the comments, it sounds as if there are more fails than successes. Guess I won’t waste my time with this project. I thought you could just use any photo, but apparently, it must be a laser printed photo, so unless you have a laser printer handy, it probably won’t work very well. Too bad. Looked like a fun project. Your local library is bound to have a laser printer that allows the public to enjoy for a small fee. Yup! that is where I get all of mine printed. Great tip! Awesome! Great tip. Thanks for sharing! An inexpensive source for standard-sized small pieces of glass would be your local thrift store on ‘sale’ day…snap up those cheap ugly frames and just use the glass…it’s bound to be less expensive than going to a frame shop and having it custom cut. Yard sales and resale shops! Just a question, would this technique work on candles? christening etc…. as candles are quite inexpensive items these days. This technique works on almost any medium…so it MIGHT work on a candle. Not sure how the wax would factor it, but since candles are cheap, I say give it a try—and let me know after you do!!! Let the paper soak for a while. and then very gently rub with the pads of your fingers. I hope that helps. Can you use a blow dryer or bake the glass to speed up the drying time? that is an interesting idea. I have never tried it, so I can’t say. But, I’m not sure it’d be a good idea since the process is already a little delicate. It worked. It turned out beautiful. Thank you so much for this idea. yay! I am so thrilled to hear that! And, thanks for stopping back and letting me know. I just let it air-dry over night. I wondered this too if it would be able to be washed? Also, do you think it would fade easily in the sun? I was thinking of doing this on something that would be outside….do you think that would be a good idea? Although it is a cool effect it isn’t the toughest thing. I wouldn’t wash it, but I *think* it would be fine with the sun. I hope that’s helpful! After reading your fun post I set out on a mission to create awesome stuff but it hasn’t worked out and now I’m sad 🙁 The back of the MOD PODGE packaging goes through a process of creating a decal by using wax paper, huh??? You made it look so easy. Any tips? I can not get a single image to transfer to glass. I am using regular copy paper, laser toner, MOD PODGE Photo Transfer Medium and glass. Hi, Nancy. 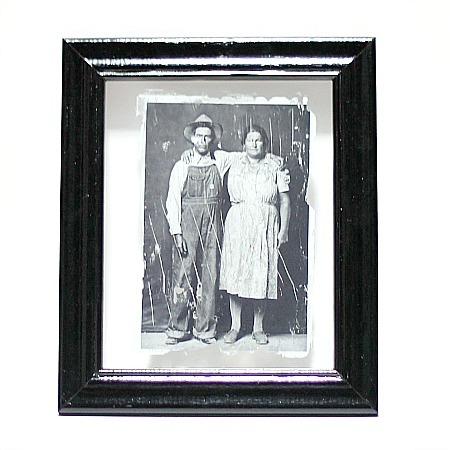 What do you know about making a tintype? Is it a similar process? Can you do a blog enter on doing one? Thanks! I love this idea and am currently working on a wedding gift for this upcoming weekend. I’m transferring photos to an old window. All of them worked great besides one. I am having trouble getting the back rubbed off of one. It is very pale right now and has a pink tint. I can tell there is still paper on there but can’t get it to peel, Any advice? Also if I can’t get it to work is there a way to remove the entire image and start this pane over? I’m kind of in a time crunch been working on this for a few days now. How do I subscribe to your (fabulous) blog via email? This is great. A lot of your crafts have come up in my pins so I feel like I’m stalking a little bit too! I have the transfer gel and keep looking around for new things to try… empty jars, old wooden furniture… so many things, so little time. I’ve been stalking your site! I can’t wait to try some of these projects, if they turn out, I’ll post them and link back to you -thanks for the inspiration!! I love it when people blog-stalk me! Have fun with what you found here and please, send me links! Can’t wait to see how your projects turn out! I have attempted this on a glass bottle but when it came to getting the paper off (8+ hours later) the whole picture peeled off. I basically had a homemade bumper sticker!! What am I doing wrong? I need help! First try at this craft. Wondering if an inkjet printer will work? Hello! Thank you for sharing! I have never done such transfer but do you know how durable and practical this is? Does the image come off with a scratch? Im thinking mostly about jewlery. Just as it is written here, it is probably not strong enough for jewelry–but if i were you I would just give it a few coats of Mod Podge. That should do the trick. I’d love for you to send me any picture of finished projects. Sounds cool, what you are planning! i was wondering if you can just use a regular photo to do this ? You can use any picture, as long as it is printed with a laser jet printer on regular paper. Also, since the transfer is never perfect, I have better luck with less details pictures. Good luck! Here’s the thing about photo transfer–it is never going to be perfect. You can see in mine that there are streaks where picture rubbed off. For that reason I shy away from doing close-ups for people faces, because if an eye rubs off, it looks weird. Also, try using the Mod Podge image transfer gel. I’ve had the best luck with that. Good luck!! I tried doing this, but the paper did not stick to the glass. I am attempting it onto a wine bottle. When I was rubbing the paper off, chucks of the paper were just coming off with no transfer! What am I doing wrong? Thanks, I love the project and hope to be able to do it! Hummm, first off, try using the Mod Podge brand of image transfer gel. I’ve had the best luck with that. Next, it is super important that when you put the gel on the paper, and the paper on the glass that the entire image is covered. Then, I usually spent some time gently rubbing the back of the paper to get all of the gel blobs out. You want a nice even coat. I’ve also had issues were if a tiny section of the gel dries before is get to the glass the image will not transfer. I hope some of that helps, and that you have some success. Sounds like a cool project!! Trying to do this to a christmas ornament but can’t get it to work. What kind of paper? regular photograph? I’m so glad you are trying it…and what a cool idea to do it on an ornament. You want to use a picture that is printed with a laser jet printer on regular paper. and, be warned, it takes some time and effort to get all of the paper off. I’d Like To Try This On Maybe A Glass Vase, When Giving Flowers As A Gift. I Wonder If It Will Be Ok When It Gets Washed? If you cover the picture with some sort of sealant (or even a glue or some sort that isn’t washable) it should be perfectly fine. Ah This is so cute! I am going to try it on some old windows I have! If you get a chance, would you link this up to our blog hop? I think our readers would love it as well! Thank you! Nancy, this is a very cool craft. Love the pic, reminds me of some from my family. Found your post on Strut Your Stuff Saturday. Please stop over and link at our SUPER SUNDAY Link Party, our readers would enjoy this also. Runs now through Tuesday evening.